CHICKEN FLAUTAS - CHICKEN AND CONDIMENTS ROLLED UP IN A FLOUR TORTILLA AND BROWNED TO A GOLDEN BROWN. 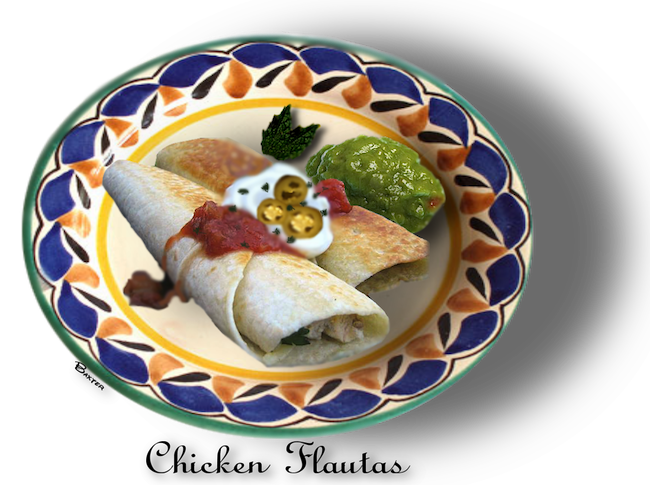 The Mexican flauta is very much like the "taquito", except that the taquito is rolled into a corn tortilla instead of a flour tortilla like the flauta. The flauta is named for its shape when rolled up, which resembles a flute, thus the word "flauta" which is flute in Spanish. The flauta is usually made with a chicken filling, but can be filled with beef, pulled pork, or cheese as well. been cut into fine strips. Cook chicken until just cooked. Add cumin and salt and pepper. 3. Set aside to cool,  and then refrigerate. seconds on each side until the tortllla is pliable**. To fill the flauta,  put one heaping tablespoon on one end of the tortilla,  add some cilantro and shredded lettuce (not too much,  or you won't be able to roll it up) and roll up. Fasten the seam with a toothpick and proceed until all are filled. 2. Serve with your favorite guacamole, sour cream,  salsa fresca or pico de gallo as a dip. and experience to get good at it.